mental models are structures of relationships, suggesting that “relationships” be a fourth ontology in Chi’s (1994) epistemological supposition (a topic for another paper all together!). “A target model (IMTS) is a mental model that students can effectively use to explain real life situations and one that is more scientifically correct than their initial models…” (Rea-Ramirez, 2008, pg. 50). Literature defining mental models has been contradicting and controversial. 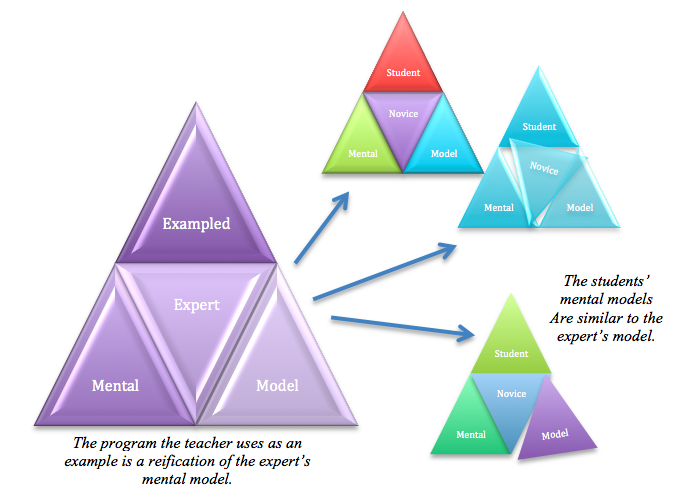 Much of the confusion regarding the definition of mental models is due to the fact that empirical studies of mental models are easiest when carried out within technical domains like physics, and thus, research is selective in which type of mental models is studied. That is, it is easier to communicate and assess a mental model that describes a learner’s visual or spatial understandings of objects in the physical world, like, how motion of an object can imply force (Clement, 1983), or mental models of electricity as flowing waters or teeming crowds (Gentner & Gentner, 1983). These “misconception” or “preconception” studies, when viewed through Chi’s (1994) theory of incompatibility, illustrate conceptual change as a learner reassigns a concept from the ontological category of matter, to the ontological process category of constraint-based interactions. Matter can be seen, touched, measured. Constraint-based interactions like force and electricity have no beginning or end, they are processes with fuzzy boundaries. Stevens & Gentner (1983) even advise that researchers stay with what is easily measurable; they should “choose domains for which there exists some normative knowledge that is relatively easy to detail explicitly…[t]he reason that mental models research has focused on seemingly technical domains is precisely because those domains that have proved to be the most tractable to physical scientists are the ones for which there exists the best explicit normative models” (p. 2). As an example, Stevens & Gentner explain that it is easier to describe novice and expert differences in mental models of physical worlds than something as abstract as interpersonal relations in a domain such as marriage. Levels of difficulty in research, however, do not discount the existence of mental models within those subjective or ethereal domains, domains that are more difficult to visualize. As a geographer and special education specialist, this is a very interesting article. Geographers have considered mental maps since the 1960’s. Layne Smith, M.S., M.Ed. reblogged this on A Teacher's Portfolio by Layne C. Smith. In my experience in instructional design, it is very useful to think of a mental model as a heuristic representation of an expert’s epistemology, rather than a representation of a reality per se. Thinking about it as a heuristic sidesteps the question of the normative or absolute nature of the content, and focuses on the utility of the heuristic as a guide to practice. It is not intended to be absolute – rather, it is a kind of an 80-20 representation of the algorithms in terms of which experts know, think, decide, and act. I think of mental models as ‘epistemologies’ in the Batesonian sense – Bateson described epistemology as the set of rules whereby an organism ‘knows, thinks, and decides. More and more what we find is that knowledge is not useful in instruction – epistemology, however, is extremely so.